This was my first full attempt at baking with an 11-month-old. When he was younger I tried the whole baby wearing thing, strapping on my fancy Baby Bjorn carrier, Moby Wrap, and Kelty backpack. All were complete fails. Now don’t get me wrong, I love wearing him, but it must be outside where there is enough stimulation that he does not realize I have him pinned down. In the house, he would arch his back and throw his scrawny body every which way while screaming at the top of his lungs. I imagined his little screeches saying ‘You can’t hold me down Mom! I will make you pay!’. So, you can imagine how quickly I abandoned baking. 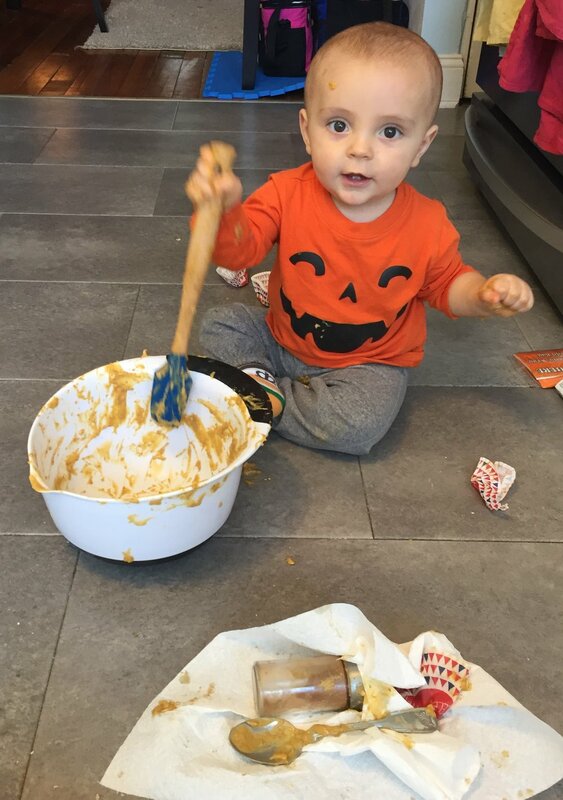 But today he is crawling and toddling, holding spoons and banging on pots – so I thought, maybe he could help?? I want him to explore flavors and textures, and hopefully cultivate an appreciation for good food. This was a perfect recipe to start with because it was easy and all done in one bowl. I should warn you, that multiple health code violations were created in the process. First, I got out the bottles of olive oil and maple syrup, placing them on the ground. He promptly crawled over to investigate, which was the start of the mayhem. We cracked eggs and watched the yolks and whites mix together. 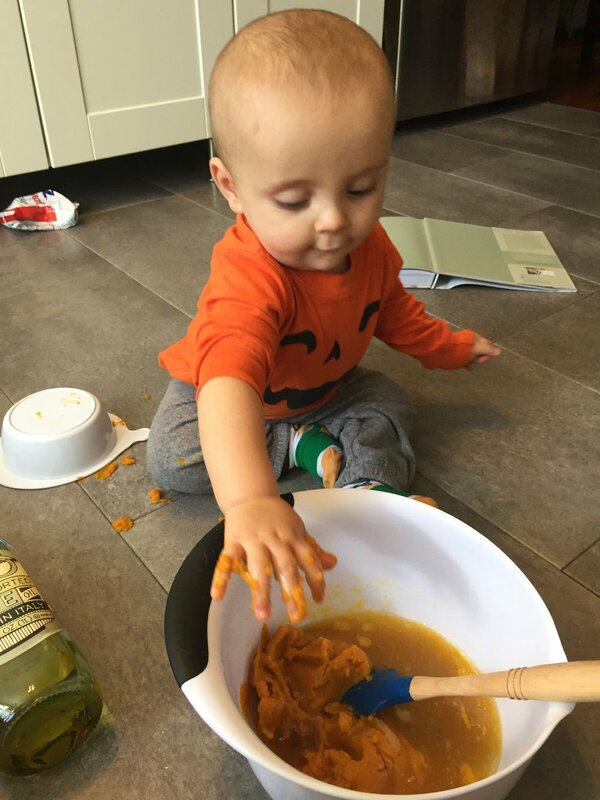 We squished pureed pumpkin in our hands and watched the orange flesh ooze out between our fingers. I had him smell each spice to see if he had a favorite (it was a tie between cinnamon and nutmeg). Every time a new ingredient was added to the bowl his pudgy hand went right in after, regardless of how vigilant I thought I was being. By the end of this process my kitchen was a disaster but we had a blast. 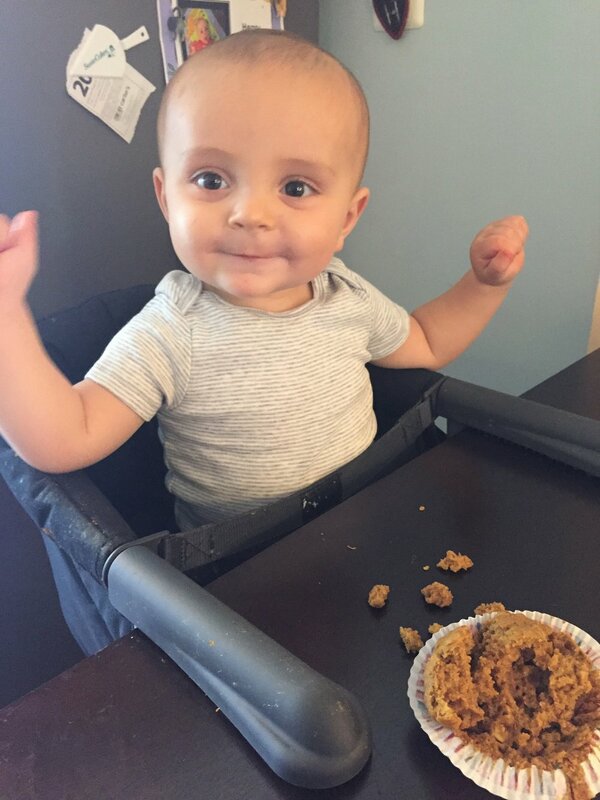 Believe it or not, we did end up with a dozen good-looking muffins, and they passed the kid taste test. He ate an entire one himself, so I can honestly say these are kid tested and approved. This was a wonderful sensory activity, and perfect for a fall day. 1. Preheat oven to 325°F and place muffin liners into tin. 2. Combine the olive oil, maple syrup, eggs, pumpkin puree, and milk. Mix thoroughly with a fork until completely combined. 3. Stir in the baking soda, vanilla extract, salt, cinnamon, nutmeg, and allspice. 4. Mix in the flour, wheat bran, and oatmeal. 5. Spoon the mixture into the lined muffin tin. This should make 12 good sized muffins. 6. Bake for 22-24 minutes. Allow to cool for 10 minutes before transferring to a cooling rack and cool completely. This is a great recipe to freeze. Individual muffins can be defrosted by wrapping in a paper towel and placing in the microwave for 30-60 seconds. Halve your Cake LLC offers personalized nutrition programs to achieve your optimal self.